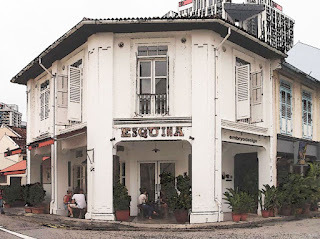 We arrived at the Esquina Tapas Bar on Jiak Chuan Road just after the opening time of 6pm to take the last empty table outside. 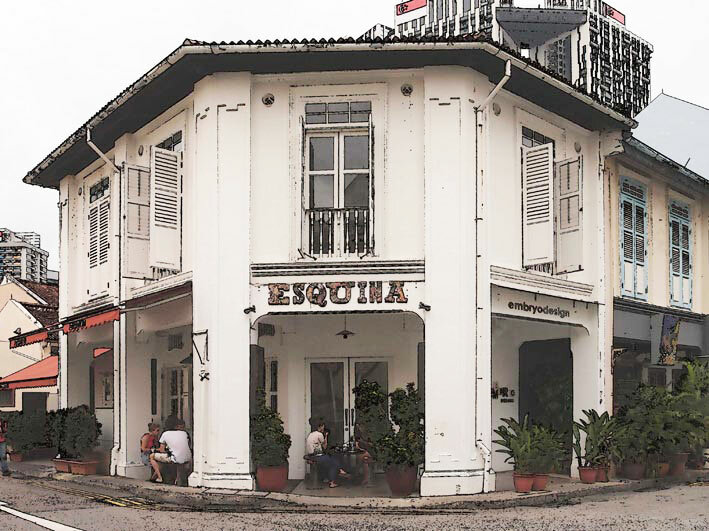 Inside the long bar was packed with customers perched on uncomfortable stools while others sat on smaller seats around tiny tables next to the pavement. The hostess was turning away large numbers of customers and people who ‘had friends inside’ that seemed content to return after an hour-and-a-half. Judging by the menu, I thought it highly unlikely that our table would be available after ninety minutes. 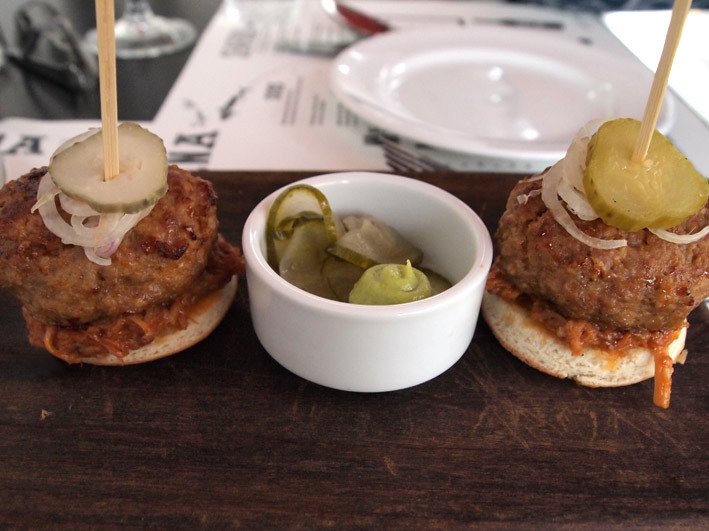 After some deliberation, we chose the veal sweetbread and foie gras empanada and the Ibericao pork and foie gras burger from the placemat menus. Based upon the excellent descriptions in the wine list, Mrs M chose a glass of Voignier Sainte Fleur whose ‘floral but mineral notes of peach, apricot….and honeyed aromas’ reminded me of a garden in a French gîte. Sadly, the Estrella Inedit beer (produced for the El Bulli restaurant in Spain) was no longer available due to problems with the importer. The beer, which was produced by Ferran Adrià for El Bulli may be over-hyped, but I was looking forward to the opportunity to make up my own mind. Still, the Mahou 5 stars was light and refreshing accompaniment to the delightful pork sliders. 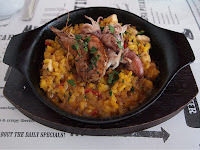 As Mrs M was pacing herself for the desserts, we then shared a splendid seafood and squid paella. Palate-cleansing sangria and mixed-fruit ice creams preceded Mrs M’s favourite, chocolate mousse. My pistachio cake and sangria jam was perhaps the finest dessert I have ever experienced. 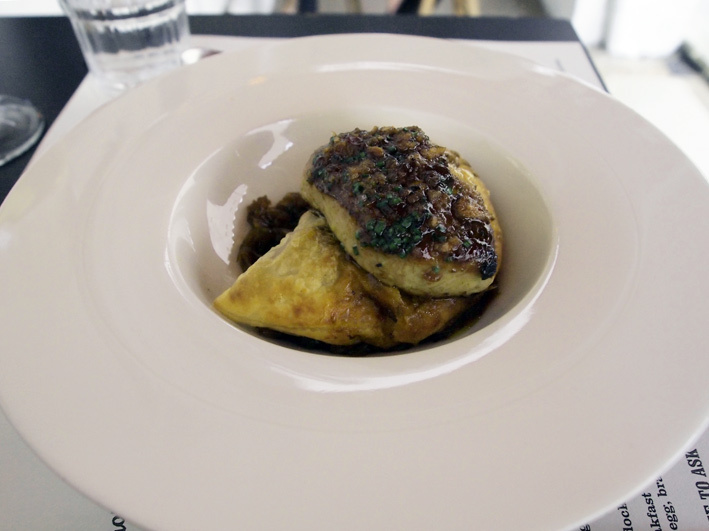 Although the final course of Manchego cheese lacked the excitement of the earlier dishes, it did not affect the overall enjoyment of what was the best meal we had experienced in Singapore. We thanked Andy the Head Chef who mentioned that some customers wanted to be able to make reservations or suggested that children should not be allowed. There are plenty of posh restaurants in Singapore. Esquina is a casual high-turnover restaurant where people in tee-shirts and flip-flops or high heels and slinky black dresses can enjoy really good food. There should be more like it. On the subject of posh restaurants, we have reservations at Jason Atherton’s other venture ‘Pollen’ in a couple of week’s time. After visiting the ‘Pollen Street Social’ in London recently (see below), Mrs M is already considering her dessert bar strategy for the new restaurant in the Gardens by the Bay. Can’t wait.